A Dayton Nursery specialty since 1973! Azaleas and Rhododendrons have commanded a prominent place in the landscape of northeast Ohio for many years. The brilliant Azalea blooms and Rhododendrons, with their large jewel-like flower trusses, add interest and pizzazz to an otherwise boring landscape. As beautiful as they may be, if not planted properly, Rhododendrons and Azaleas can be a source of headache and disappointment to do-it-yourself gardeners. You can avoid such problems by following a few simple rules for planting and culture. Remember, when properly planted and cared for, these plants will reward you with years of beauty and enjoyment. These planting instructions should also be used for Kalmia, Leucothoe, Pieris and Blueberries. 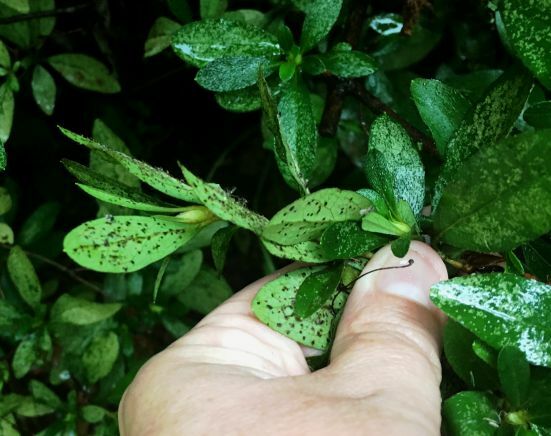 Important… DO NOT follow insect and disease control on this page for blueberries as they are an edible crop. On which side of my house should I plant Rhododendrons and Azaleas? In the country or other open areas, Rhododendrons and Azaleas will usually thrive on either the north or east side of a house. If planting on the north side, place the plant three to four feet away from the foundation of your house. In this way, the plants will receive adequate light when the sun is high during summer. Conversely, during winter the house will shade your plants from the drying effects of the sun, which can be especially harmful if the frozen soil prevents a water uptake. Winter wind and sun can be a damaging combination to your plants. Eliminating one or both will greatly improve your chances of success. Blueberries are deciduous so that they need less protection from wind. On the other hand, those who live in the city will find that any side of the house is usually god for planting due to the low wind speed factor. Remember to keep plants three or more feet from the house foundation to allow adequate rainfall to reach the roots. Planting a few feet away from the house will also avoid damage from the sun reflecting off a brick or white-sided exterior. Generous house overhangs, shallow invasive tree roots, or a dense tree canopy over Rhododendrons and Azaleas spell disaster. Each of these conditions can cause dry soil which inhibits root growth so the plant does not become established. Dig the planting hole at least 3 times larger than the root ball and about 1.5 times as deep. Remove and discard excavated soil if it is hard and compacted clay. 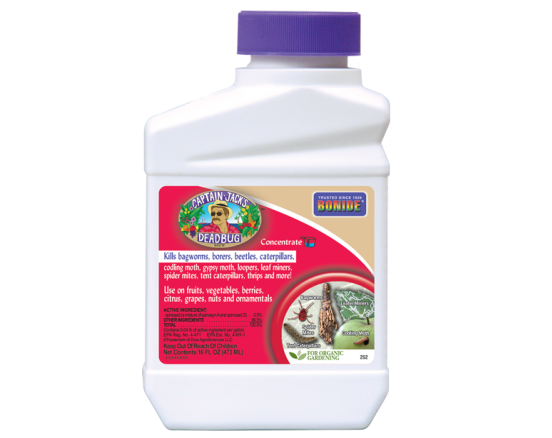 Mix pre-moistened sphagnum peat moss and ordinary good topsoil at a 1:1 ratio. NOTE: If you purchase topsoil, do not use discount store topsoil as it is not topsoil. You may purchase real topsoil from Dayton Nursery in bags. Also, if you use the dry bales of Canadian Peat, be sure to pre-moisten the peat before mixing with the soil. Some compost mixed in the planting mix is beneficial as long as it does not exceed 25%of the planting mix. Sweet Peet is excellent to use in place of compost but do not use in place of peat moss. Prior to planting balled and burlapped plants, pre-soak them in a tub of water for about an hour and then let drain for an additional hour. It is usually not necessary, but you may soak container plants the same way if the root ball is on the dry side. Remove the burlap or pot from the plant, preferably in a shady area, and with a sharp knife, vertically slice the root ball a dozen times about an inch deep along the sides and of the ball from top to bottom. DO NOT cut the top of the root ball. Expose about one inch of the root ends of the root ball by spraying the ball with a forceful stream of water. DO NOT spray the top of the root ball. First picture shows example of root wash, second picture shows how plant should look after root wash. Click on images to view a larger size. Place the plant quickly in the planting hole after its root wash and immediately cover with the previously prepared topsoil-peat mixture and lightly tamp the loose soil with your foot being careful not to damage the root ball. IMPORTANT: In heavy clay subsoils, the root ball must be elevated at least one half above the original soil level with the planting mix mounded around it or it will not drain properly. See diagram below. Apply about a 2 inch layer of mulch or pine needles and water thoroughly until the soil is thoroughly soaked. NOTE: DO NOT use water run through a water softener. 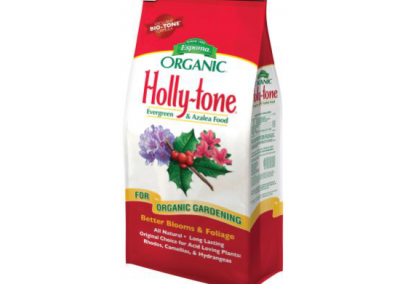 Apply Holly-tone at the rate of 1/2 cup per foot of branch spread for new plantings. For larger plants, 3 feet or more, use 1 cup per foot of branch spread. On established plants, double the rates given above and apply in April, June and October. 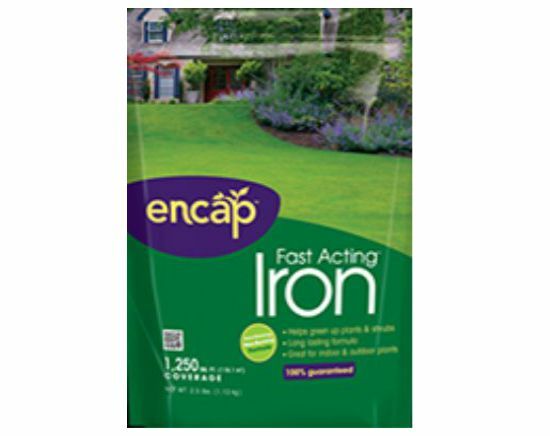 Iron Plus is a good supplement for extra iron as acid-loving plants are heavy iron feeders. Question: Do Azaleas and Rhododendrons prefer sun or shade? In general, most Azaleas will grow very well if they receive four hours or more of bright sun per day. Rhododendrons will grow nicely in full sun to moderate shade. A few Rhododendron varieties such as ‘Caroline’, ‘Scintillation’, Yakushimanum hybrids, ‘Hong Kong’ and the new hardy varieties from Finland must have some shade in midday or the foliage will yellow or even burn – especially during a hot summer. On the other hand, if shade is too dense, it can cause fewer blooms and spindly growth. Dense shade and poor air circulation can also be deadly to Rhododendrons. 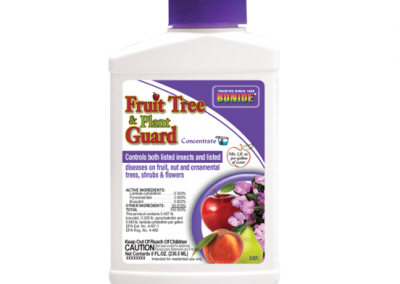 The combination frequently results in fungus which attacks new plant growth and eats away at the plant branch by branch. *The rates below reflect a peat soil mixture of 1 to 1 with the planting hole 3 times the root ball diameter and about 1 1/2 times as deep. Sweet Peet may be added in addition to the peat moss at 1/2 the given rates. To measure the peat moss of a large quantity of plants, use our volume chart at the bottom of the page. 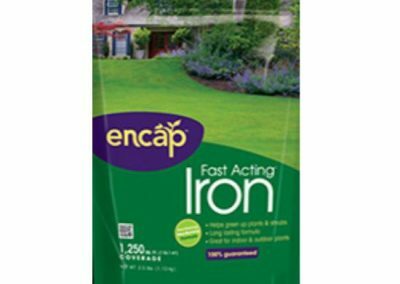 Question: How should I fertilize my plants? 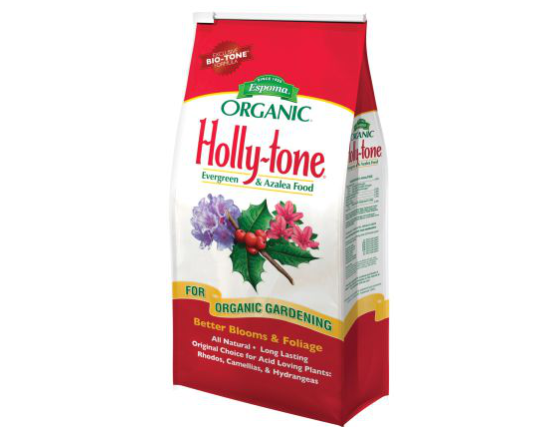 Newly planted plants may be fertilized with Holly-tone at half the recommended rate. 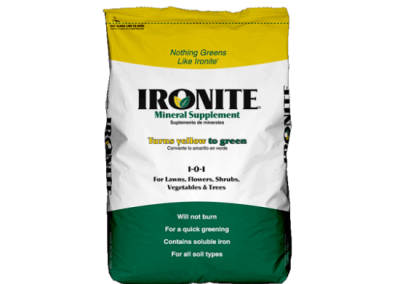 An application of Iron Plus or Ironite at the recommended rate is helpful as it supplies Iron as well as other trace elements. Water the plant well after application. Also, scatter the fertilizer evenly under the drip line of the plant and never concentrate it in one spot or next to the trunk! 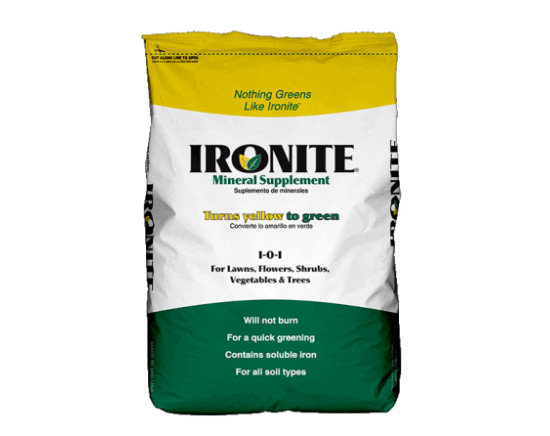 Established plants may be fertilized three times a year: April 1-15, June 1-15, October 20-November 10. Do not fertilizer after July 4th on established plants (except for late fall feeding) as plants may become too “soft” to go into winter. Always fertilize a Mountain Laurel at half the recommended rate as they are more sensitive to fertilizer burn. Finally, if the weather is somewhat dry, water the Holly-tone in thoroughly. Rates to use on established plants: 1 cup per foot of branch spread, double the quantity if the branch spread is three feet or larger. Important: The above rates should be cut in half for new plantings and for Mountain Laurel. Question: When and how do I trim my plants? Most varieties of Rhododendrons and Azaleas will respond well to trimming. Just trim plants to shape. Azaleas may be trimmed anywhere along their stems and will re-grow new sprouts. Rhododendrons like to be trimmed just above a fan of leaves as the new leaves will sprout from this cluster of leaves. 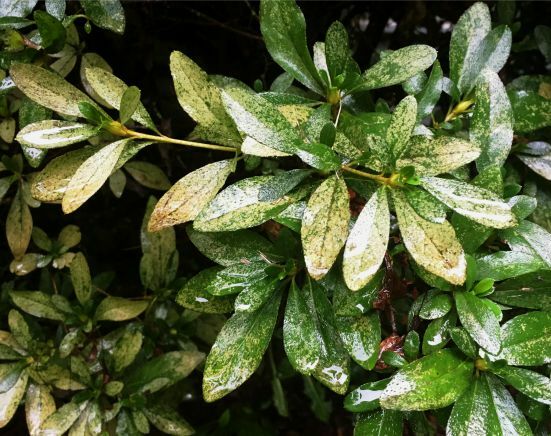 You can “pinch” Rhododendrons to encourage bushier growth by breaking out the dominate center growth bud when new growth buds just begin to expand in spring. Do not pinch out the fat flower buds! After Rhododendron flowers fade, remove the old flowers and flower stalks for faster growth and more bloom the next spring. Trim your plants right after they bloom. Trimming later in the growing season will cut off bloom for the next spring and keep disease caused by rotting flowers to a minimum. 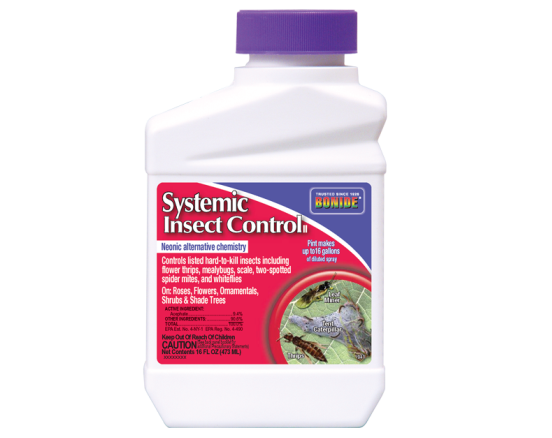 Question: What about insecticides and Lacebug? 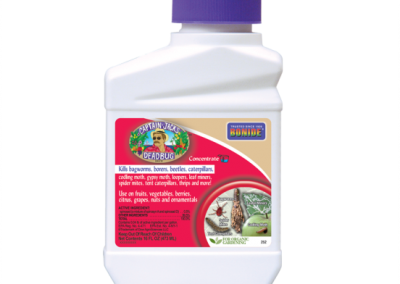 You MUST apply Bonide’s Systemic Insect Spray at least 2 times per year June 1st and August 15th, as directed, to prevent lacebugs. 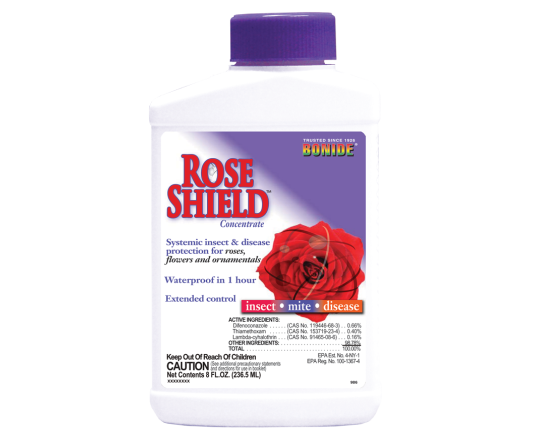 As an alternate, you could also use Bonide’s Rose Shield or Fruit Tree & Plant Guard when bees are not present. An existing Lacebug infestation will turn the foliage a light to golden brown. The damage shown from Lacewing is spotted discoloration of the upper surfaces of the leaves. 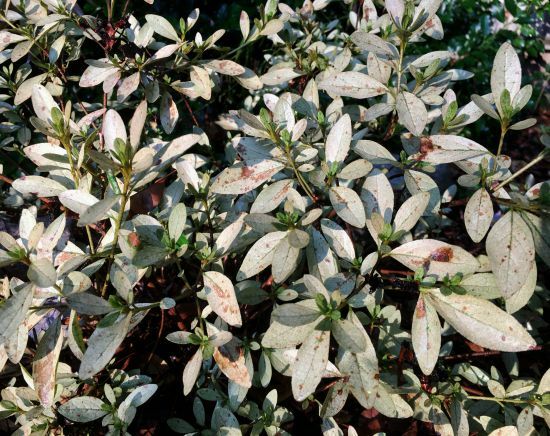 In severe infestations, the leaves become almost white, many of them drying completely and dropping off. The undersides of the leaves are also disfigured by the excrement and cast skins of the insects. The undersides of the leaves may also show brown spots or an all over brown coloring. 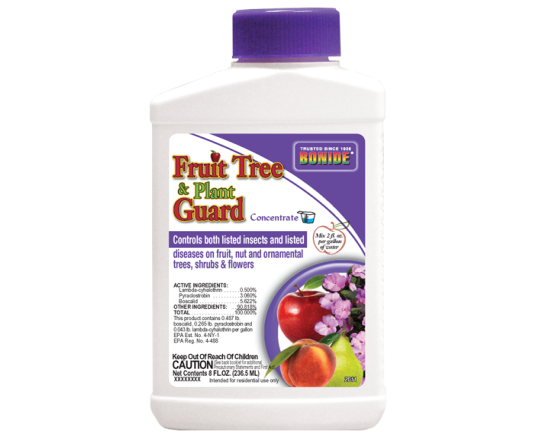 Spray large-leaf Rhododendrons with Bonide’s Captain Jack’s Deadbug Brew for borer control around June 1st. Question: What about Root Rot? This group of plants can be prone to phytophthora root rot. Apply Agri-Fos® Systemic Insect Spray if damage occurs. 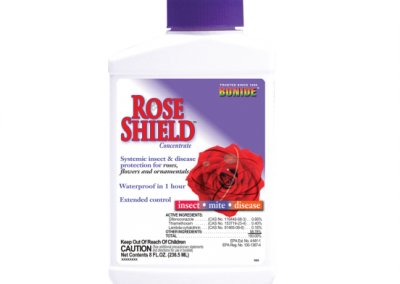 This product can also be applied as a preventative.